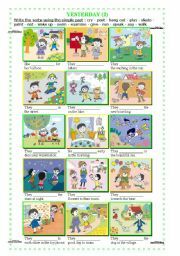 This is a worksheet in which the student has to write the verbs given using the past simple form. 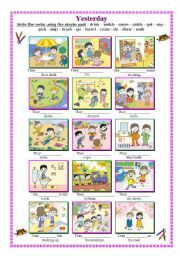 15 sentences and 15 pictures of daily activities. Other are coming next days. This is a past simple drill worksheet. 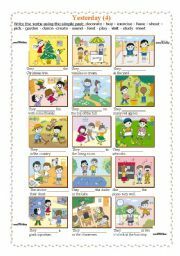 Students have to complete the sentences with the past simple form of the verbs and associate with the pictures. Also a revision of countries! Hope you enjoy it! 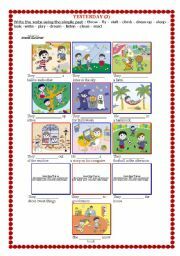 This is another worksheet in which the student has to write the verbs given using the past simple form. 15 sentences and 15 pictures of daily activities. There are 3 different ones today. This is the fourth worksheet about past simple. 15 pictures and sentences. Verbs are given and students have to fin the past simple form and write it. 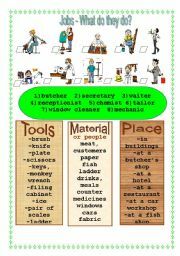 This is the second one of two worksheets to learn and know a bit more about jobs (each worksheet has got a drill on the second page). You can find the other one today under this title:Jobs - What do they do? 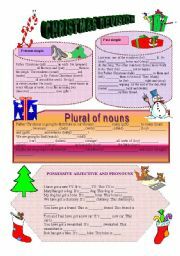 Both worksheets are editable. 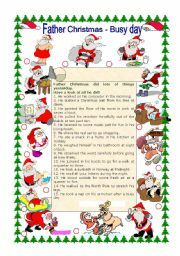 This is another worksheet in which students have to fill in the vers ising the past simple. 13 pictures and sentences. The 3 pictures that don´t appear in the preview appear once downloaded. Anyway it does on my computer! 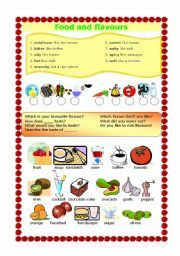 This is a worsheet to explain with pictures the different flavours and some questions to use them with different food. Jobs - What do they do? 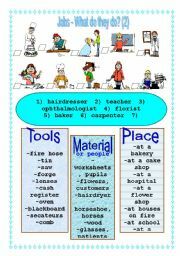 This is the first one of two worksheets to learn and know a bit more about jobs (each worksheet has got a drill on the second page). You can find the other one today under this title:Jobs - What do they do? (2). 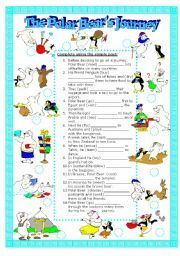 Both worksheets re editable.